A unique duo with a special quality to their musical sound. Specializing in music for pubs, concerts, folk festivals weddings, concerts, and private house concerts. They combine the sound of their vocals with Celtic harp, Classic guitar, Irish tin whistles, fiddle, mandolin, also, variety of percussion instruments such as, bodhran, zills, castanets, dumbek, and congas. Comprised of Patrick & Patricia De Gabrielle. Their stylings include everything' from traditional ballads to more contemporary sounds. 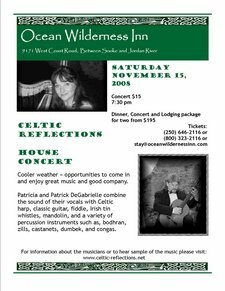 In addition to their Celtic repertoire Celtic Reflections are also very much into world music and classical and jazz.